Hi everyone,this week I intend to continue on with some gorgeous recipes for healthy mind, body and soul. Lately I have been spending a lot of time in the gardens here at Ballyknocken House & Cookery School. I just get so excited when I see all the wonderful, herbs, vegetables and soft fruits begin to flourish. 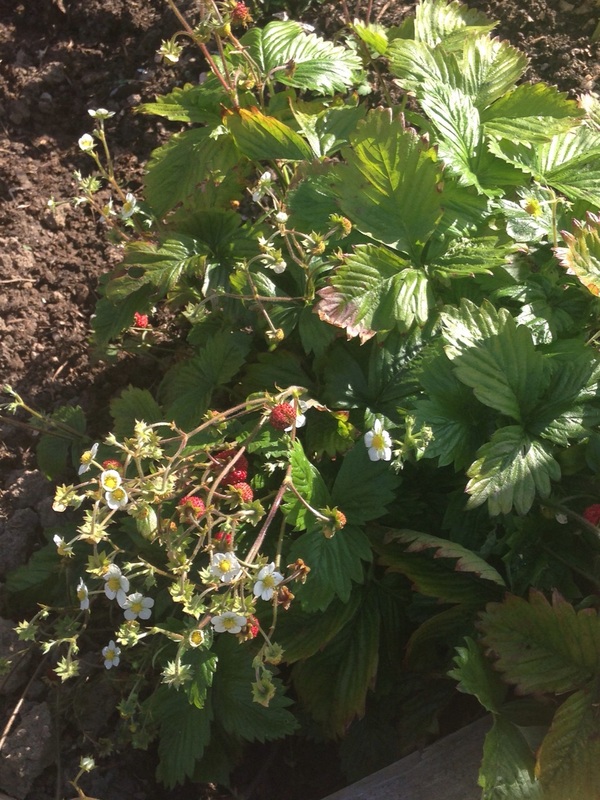 Here in the picture you can see some beautiful Alpine Strawberries in bloom. I just love them. There is nothing like the feeling of plucking some gorgeous fresh berries from the ground and getting them into my kitchen to include in some tasty new recipe I am trying. On this note for all things berry…………. If you would like to make some gorgeous Berry recipes I have written them in the RTE Guide this week and if you pick up a copy you can make them at home yourself. 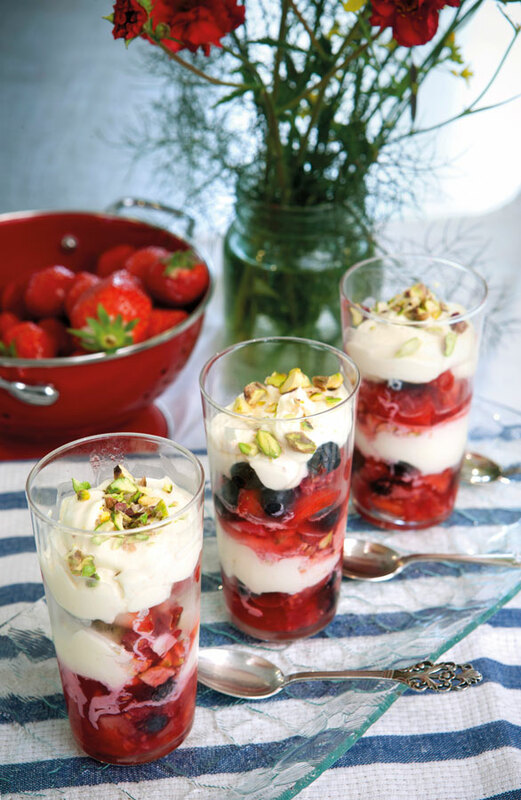 I included Chilled out Strawberry Lollies, and Berry Parfaits below, YUM. Bake these the day before and just heat them 20 minutes before you’re about to serve. Keep the parchment wrappers on when you serve them – the children will love them as well as grandparents! If you have any left, pack these for your lunch at the office with a refreshing rocket and pink grapefruit salad. 1 Preheat the oven to 180°C/fan 160°C/gas 4. Line a 12-hole muffin tray with square pieces of parchment paper. 2 Heat a little extra virgin olive oil in a large frying pan over a medium heat and sauté the leek for 5–6 minutes, until cooked. Add the spinach to the pan and cook for 1 minute more. 3 Spoon the leek and spinach mixture into the muffin tray and layer the finely sliced butternut squash on top. 4 Whisk the eggs, cream, thyme and some salt and pepper in a jug, then carefully pour it over the butternut squash and leek layers. Sprinkle with the parsley and bake for 15–18 minutes, checking that they’re cooked and set by inserting a skewer. Do not overcook. 5 Remove from the muffin tray and serve warm with sprigs of thyme on top. Well I am really excited to be once again taking part in RTÉ Ones ‘The Taste of Success’….and you can read all about here taken from the RTE website with all the information you need. ‘The Taste of Success is back and we are now looking for YOUR amazing food product ideas. Are you an amateur chef with a twist on a classic? Are you a professional chef with a signature dish? Are you a baker with the best buns? – Is your idea worth €100,000? If so, and you fancy seeing YOUR product on supermarket shelves nationwide – we want you! RTÉ One is searching the country for the next winner of ‘The Taste of Success’. This person will walk away with a guaranteed contract with Lidl Ireland which will see their product on shelves in 140 supermarkets nationwide. This competition is open to anyone who has a wonderful food product. So it might be your granny’s delicious bread recipe, a tasty new jam or sauce combination you’ve concocted or your special occasion desert. You might have dreamed up an innovative new health food product or it could even be your own home brew! Have a look around your Lidl store and find out if you’ve got what it takes to discover what they’re looking for. The most important thing is that entrants must submit their own unique product. Closing date is Thursday 7th MAY 2015 @ 5pm. If you aren’t making this for brunch, it also works really well for match food or late night suppers and it’s much easier than making the usual fry-up. Choose good-quality sausages from your local butcher. 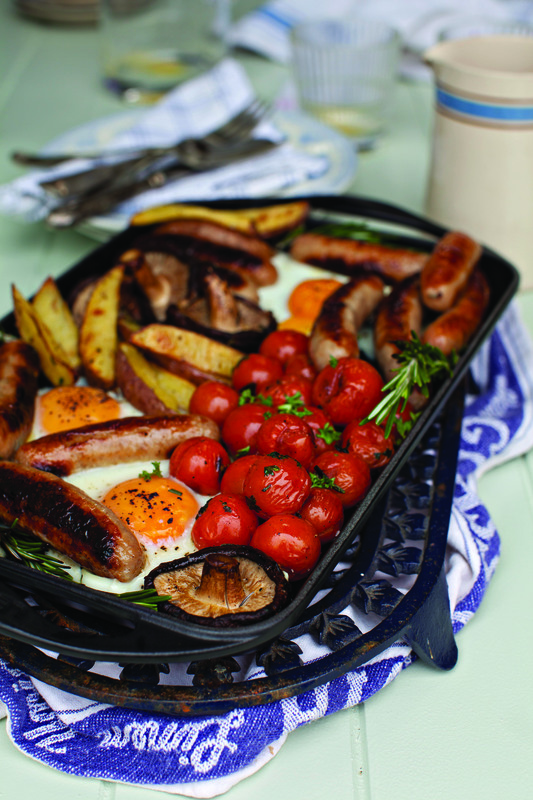 It’s the easy way out, a one-pot breakfast that saves on the washing up, a definite crowd pleaser and it’s delicious – can it get any better? 1 Preheat the oven to 180°C/fan 160°C/gas 4. Brush an ovenproof shallow casserole or roasting skillet with oil. 2 Place the potato wedges into the casserole dish or skillet and roast in the oven for about 12 minutes. 3 Add the sausages and cook for a further 10 minutes, turning them over once or twice during the cooking time. 4 Add the cherry tomatoes and mushrooms to the casserole dish or skillet. Drizzle a little more oil over the vegetables and season. Cook until the potato wedges are crispy and the tomatoes are roasted. 5 Make 4 gaps in between the vegetables and carefully break an egg into each. Season lightly with salt and freshly ground black pepper. Return to the oven and cook for a further 5–6 minutes, until the eggs are set. Sprinkle with chopped fresh parsley and serve immediately with toast.